This is part one of a series of posts that will examine the Republican delegate allocation rules by state. The main goal of this exercise is to assess the rules for 2016 -- especially relative to 2012 -- in order to gauge the potential impact the changes to the rules along the winner-take-all/proportionality spectrum may have on the race for the Republican nomination. For this cycle the RNC recalibrated its rules, cutting the proportionality window in half (March 1-14), but tightening its definition of proportionality as well. While those alterations will trigger subtle changes in reaction at the state level, other rules changes -- particularly the new binding requirement placed on state parties -- will be more noticeable. 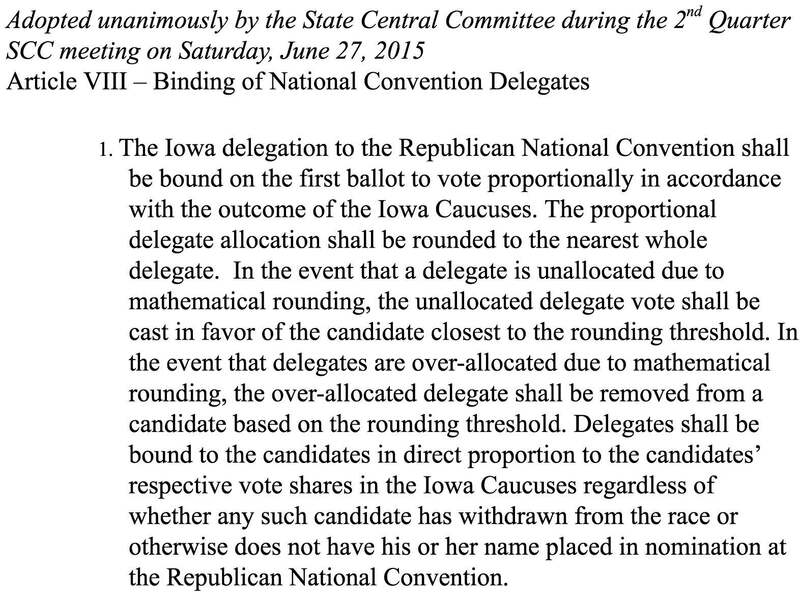 Back in the summer, FHQ discussed how Iowa Republicans could respond to the new-for-2016 RNC requirement that states bind their delegates to candidates based on the results of the preference vote in primaries and caucuses. As first in the primary calendar queue, the Republican Party of Iowa has a bit of a balancing act to pull off and with a number of options to boot. On the one hand, the party could have chosen to hold winner-take-all caucuses (Carve-out states do not fall under the proportionality requirement.). And while that would have had Iowa giving a candidate a sizable delegate boost right out of the gates, going that route is not all that consistent with how the national party views Iowa's and the other carve-out states' role in the process; as part of the "on-ramp".2 Iowa also has some interest in retaining its first-in-the-nation status. Acting counter to the intent of the national party is not in the the way to achieve that outcome. Instead, Iowa Republicans opted to comply with the new binding requirement by adopting a strictly proportional method of allocating its 30 delegates to the national convention in Cleveland.3 And they did so in the simplest terms, tying the delegate allocation to the statewide vote in the February 1 caucuses (rather than splitting it up based on the statewide and congressional district results). Candidates, then, will win delegates approximately in proportion to their vote in the caucuses assuming they receive at least a 3.33% share of the vote to mathematically qualify for delegates. 1 If n-1 candidates all receive a share of the vote that rounds their share of delegates awarded up, and if there is still an unallocated delegate, then that last candidate would be granted that delegate by virtue of being "closest to the rounding threshold". This is technically true even if that candidate -- the last remaining candidate -- receives just one vote. Now, this is unlikely to happen, but does give us some indication that, depending on how the vote breaks, Iowa could allocate delegates to some candidate with virtually no threshold. 2 Roughly, that "on-ramp" is a sequential retail politics environment that gives voters in smaller states the opportunity to meet and hear from the candidates face-to-face. By extension that levels the playing field by not forcing candidates, their campaigns and attendant super PACs to immediately prepare for a multi-state fight waged over the airwaves. In other words, the on-ramp is intended to nurture competition and potentially create momentum behind any candidate, regardless of resources. 4 Importantly, if only one candidate is placed in nomination at the Republican National Convention in Cleveland, then the entire Iowa delegation is bound to vote for that candidate. So the RNC is Floating the Idea of a New Presidential Primary Order? I have looked for hours but can find this answer nowhere, even in the Iowa GOP bylaws, or the RNC Rules. In the Iowa GOP caucuses each precinct will conduct a vote for presidential nominee. Those precinct counts are recorded along with the count of the total votes for that precinct. My question regards how those counts are then tabulated to come up with the statewide vote. I am assuming that they are simply all added as is. So say e.g. Precinct 123 has 100 people show up and vote and 20 vote for Cruz. Precinct 457 has 10 people show up and vote and 2 vote for Cruz. Then I assume the statewide vote shows 22 votes added for Cruz. I.e. I assuming that Precinct 123 has ten times the weight in choosing the National Assembly Delegates as Precinct 457 because it had 10 times as many show up and vote. I hope not. I hope that the statewide count "normalizes" the count so that each precinct has equal weight. Could you please explain which it is? Is each precinct's votes counted and added to the "statewide vote" as is or are the counts normalized (e.g. divided by the total number voting in that precinct's caucus) before added to the statewide vote count? There is no "normalization" process, Peggy. The numbers from each precinct are simply aggregated to produce a statewide total from which delegates are allocated to candidates. Thank you, Josh, for the quick reply. I do wish the counts were normalized, but I guess if folks want their precinct to have an impact, hey, they better get out there get folks to the caucus. Again, thanks! There's some discrepancy about the three party leaders in each state, who in the past have been unpledged delegates. The Green Papers, a website which is generally reliable in delegate information, shows those 3 unpledged delegates in IA, NH, and a number of later states. Is it confirmed that the party leaders are pledged along with the rest of the delegation in any state with a presidential preference vote? I'm curious what happens to Huckabee's delegate. Are they still bound to him or nbound or, as he quit before the vote was announced, does Christie get them instead? Pinyan and Phil, I address your questions there.